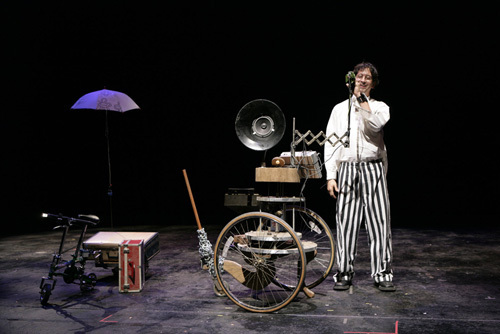 Joseph Silovsky is one of Downtown’s most unique performance artists, sort of a combination “story teller/mad scientist”; for he is a deft inventor of one-of-a-kind mechanical props that he uses to tell his strange tales. 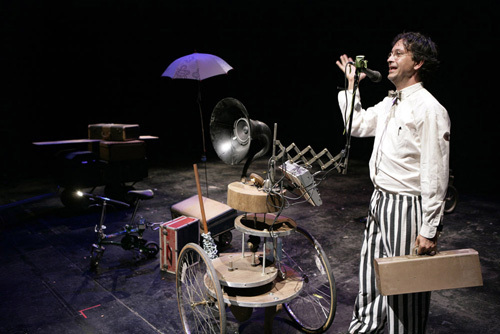 For years he has been doing brief one-person shows that never fail to amuse and edify, but Jester of Tonga is his first full length show. So, Joseph, tell me about this Jester of Tonga. It turned out that Dean made some bad investments too, and then came the stock market techno crash of 2000. Tonga lost all its money and eventually sued Dean. The case was settled for $1.5 million and Dean declared bankruptcy. Should you be telling me the whole story, Joseph? It's OK because the fascinating stuff is in the details, I felt, especially the personal relationship between Dean and the King. I went to California and conducted a videotape interview of Jesse Dean, and that’s part of the show. I heard that there is a second story, what’s that? The next part of the story is me, because I went to Tonga in 2006. I met some fascinating Tongans, two of whom were a fisherman and a prisoner. It's two-thirds of of the way between Hawaii and New Zealand. It’s quite isolated, 183 islands in three major groups. So the second story is your adventure. Yes. It’s intermixed with so many side stories. 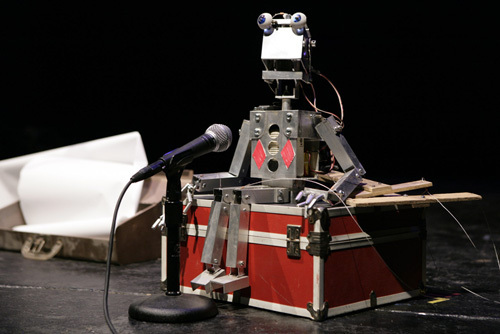 I tell it in a non-linear fashion through the machinery that I normally build to interpret the stuff, including Stanley the Robot. Stanley tells the Jester’s story, and I tell mine. Tell us a little about your machines for this show. Almost all of my props are designed to fit into suitcases. The main story is my trip to Tonga, which is shown through a diorama built into it, and a panning miniature video camera. I also built another suitcase that’s an opaque projector and a puppet space. Another suitcase has a wireless video camera, and another is a pop-up book. I understand that you have about 20 suitcases for this show. Also, I’m fascinated by maps and such, and I draw and use them during the show. And I built a Chinese “southern-facing” chariot. Before magnetism was discovered, the Chinese built a chariot with a fixture on top that always pointed south. I built a replica of that chariot and I use it in the show. I can hardly wait to see that. P.S. 122, 150 First Ave., (212) 352-3101. Nov. 13-23, Wed.–Sat., 8 p.m., Sun., 6:30 p.m. $15-20.